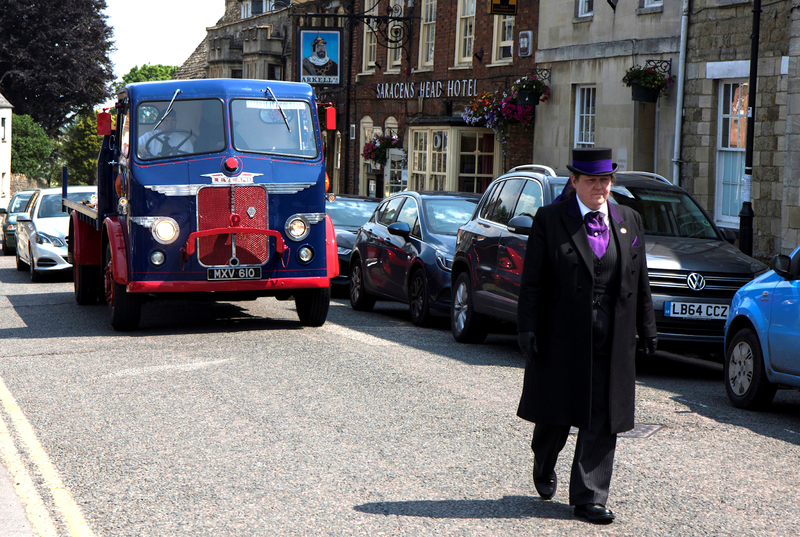 The Highworth Funeral involved the longest timescale yet experienced, from confirmation of the booking to the date of the funeral was 35 days in total. David submitted a price for a Highworth funeral on May 12th and received a call on his mobile on May 16th to say that the funeral would be on June 20th. David said to the Funeral Arranger, ‘Haven’t you got the wrong date, surely you mean May 20th?’ There was no mistake and the 1415 hours booking slot at Swindon Crematorium was advised. Families can struggle to get a particular person to conduct the service. Relatives can only fly in from America on a specific day. Some family members choose to have a holiday before a funeral! The Highworth funeral lead time was not due to any of the above factors and the reason is not known. David spoke to the Widow about the flowers and treaded very carefully about the lengthy lead time in case she was unhappy about it, however, she was happy with the timescale. David has found from his experience that a lead time beyond 7-10 days can give certain families members time to think about how the funeral could be personalised and the Highworth funeral was no exception. The Widow asked if David could accommodate within his design a Sack Barrow and sacks as her Husband had delivered bags of animal feed in the 1960’s before the advent of bulk deliveries. Rather than trying to design securement techniques remotely, a meeting between David, the Widow and her Brother-in-Law was arranged for the sack Barrow to be handed over. This was just as well because it was an original Slingsby Sliding Wheel Sack Barrow from the 1940’s and it was extremely heavy. David explained that the price he had given to the Funeral Director was for carrying the coffin and flowers only and the creation of a ‘Sack Barrow Theme’ would involve addition time and required an additional premium, which the Widow understood. So David was left with the challenge of how to secure the antique Sack Barrow and making it highly visible for all to see and become the main focal point in the area in front of the coffin. The solution involved David designing a rear end of a 1960’s Rigid with a ‘TERRY 1’ number plate and a ‘CAUTION AIR BRAKES’ sign. The Sack Barrow was secured to the 1960’s flat-bed Theme using wooden clamps and it was also fixed to the Headboard of the 1950 Leyland Beaver. David’s wife received a group photograph that included the Deceased and she skilfully cropped it and it was laminated by one of Vintage Lorry Funerals Support Members. 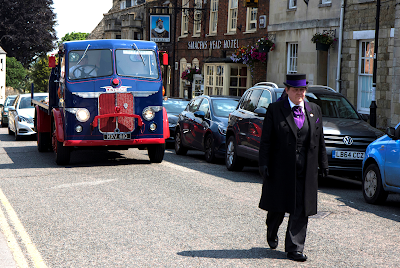 The Highworth Funeral Director is situated in a cul-de-sac and the yard is a tight 90 degree turn off a narrow road and the best way to approach the yard was by reversing in off a very busy main road. When undertaking such a potentially dangerous manoeuvre, it is paramount to attempt it when no one else is around so an early start was planned. Working out the route was simple because Trowbridge, near to Bradford-on-Avon, is on the same road as Highworth the old A361, although an extra 4 is added as the road winds through Swindon. The old road numbering system is based on the hands of a clock with London being the centre of the clock, Newcastle is at 12 o’clock and the A1 runs from London to Newcastle and beyond to Edinburgh. The A2 runs from London to Dover and the A3 runs from London to Portsmouth and roads in the sector between the A2 and A3 all start with a 2, so the A20 runs from London to Folkestone, the A21 runs from London to Hastings and the A22 runs from London to Eastbourne. The A361, however, breaks the rules because it starts in Daventry and goes all the way to Barnstaple! David left Bradford-on-Avon at 0515 hours and was in Swindon by 0620 hours. The Magic Roundabout, near the Swindon Town Football Ground is only magic if no one is around and David found it deserted when the Leyland Beaver cruised anti-clock wise around the first mini roundabout in top gear. David arrived at Highworth at 0645 hours and reversed in off the main road with a modern Lorry Driver holding back the traffic. The width of the yard into which the lorry had to be reversed was extremely tight, in fact so tight that David couldn’t get his sandwiches out of storage box behind the nearside drive wheel, the gap between the lorry and the brick wall being less than 9 inches. Luckily a Coop Retail outlet next door came to his rescue, although David had to vary from his normal ham, cheese and pickle sandwich combination. Julie, of the Memorial Department upstairs, was the first to arrive at 0735 hours and offered David a cup of tea. Vickie, also from the Memorial Department, was the next to arrive and kindly offered David the use of a private office which was a most welcomed gift on a day when ambient temperatures were 30 degrees. David used the time to write this blog and also plan out the next two funerals which were within 3 working days at the end of June and the beginning of July. Dianne from Highworth Funerals was next in at 0820 hours, her first day back from holiday, however, despite landing at a very early hour she did get the chance to make a Chocolate cake which she does for every funeral day. David tried a piece, which was offered by Paula, who spoke with a lovely Canadian lilt. David told Dianne the cake was exquisite, but he kept his distance from Paula, who had a cold, as Self Employed people can never be ill.
Jo, who conducted the Funeral was excellent, she had no trouble getting in and out of the cab, which was commendable given her short stature, and she was very communicative advising David precisely what she wanted him to do. The cortege brought Highworth High Street to a standstill and stopped outside the Beds ‘N’ Baskets Shop that the Deceased ran with his wife. Coming back through Swindon David got an unexpected present, he came across a Breeze Fuel Station which was card only with no attended staff, offering a saving of 6 pence per litre on current prices and the forecourt was deserted. David often finds small retail sites with cheap fuel, however, the queues are too long, regularly funnelling back onto the roadway and stopping the traffic. However, on two occasions in Wakefield and Swindon David has found card only fuel stations that were not only staff less but also customer less. Far be it for David to question the strategy of ‘Card Only’ fuel stations however it does seem odd that the two he has visited were in less affluent areas where perhaps only a small proportion of the people have a credit card.